Bestselling author Julie Kagawa is back with the highly anticipated fourth book of The Iron Feyseries, THE IRON KNIGHT (Harlequin Teen; November 2011; $9.99 U.S./$11.99 CAN.). Blurb: Unable to survive in the kingdom of his beloved due to his supernatural nature, a warrior prince sets out to turn himself human. But first he must cross deadly lands and overcome nightmarish obstacles before reaching the fabled testing grounds, where he will endure a series of challenges. He is joined on his quest by a team of fantastical creatures, each with an agenda of their own—one, a faery prankster whom the prince has vowed to kill for past misdeeds; another, a wise-speaking cat who claims to be a truthful guide; the third, a legendary and villainous beast pulled right from the fairy tales; and finally, the last, a seer who appears to be the resurrection of the prince’s former love, long thought dead but now restored to life and as beautiful and tempting as ever. With these dubious allies by his side, the prince sets off to achieve his ultimate prize, but to do so will require overcomingthe greatest challenge of all in his quest for a human soul—himself. When exiled faery prince Ash swears an oath to his love, Meghan Chase—the half-human ruler ofthe Iron Fey realm—to return and be with her forever, he knows what that promise entails. Her IronKingdom is anathema to a fey creature such as himself, and in order to survive in it he must renounce his powerful supernatural nature and acquire a mortal soul. Only then will he be able to return and be with his love. But even as a prince of the fabled Winter Court, Ash knows only rumors of how an immortal can become human. Ash needs help, even if that help comes from the last set of creatures in the entire Nevernever realm that he would ever want to join him. After all, in some fairy tales, the hero gets eaten by the monster and doesn’t get to live happily ever after. The first to join Ash on his quest is his best friend and fiercest, most annoying rival, Robin Goodfellow—better known as Puck the mischievous prankster. Despite their friendship, a bitter chasm exists between them—Puck is also in love with Meghan Chase, and Ash has vowed to one day kill his friend as payback for a past action. To aid them on their quest, they turn to one of the wisest creatures in the mythical realm of Nevernever—Grimalkin, a talking cat who agrees to help in exchange for a future favor. They set out to find a seer to show them the route that they must take, but on the way they encounter a legendary monster—the Big Bad Wolf. The Wolf is perhaps the most dangerous creature ever to walk the wilds of Nevernever, but now it seeks to join them on their journey so it can increase its own legend and power. The last member of the quest, however, is the most shocking of all to Ash. The very seer they have been seeking turns out to be Ash’s first love, Ariella, a fey princess long thought dead. Not only is she not dead, but Ariella is now an oracle who promises to aid Ash on his quest to be with his new love. But can Ash trust Ariella or will she sabotage their mission in order to win him back for herself? Ariella advises the party that they must follow the treacherous River of Dreams to the final barrier at the End of the World. There, in an ancient place known as the Testing Grounds, a guardian who holds the key to becoming human awaits. But in order to claim it from him, Ash will first have to endure a deadly series of tests. As Ash gets closer and closer to fulfilling his quest, he finds it more and more difficult to go on. He is being pulled in many directions—by his two loves, by visions of a deadly future, and by indecision that could destroy him, his allies and all of Nevernever. Ash is under oath to Meghan to complete his quest, but can he do it? After all, in some fairy tales, the hero gets eaten by the monster and doesn’t get to live happily ever after. 1. Where did you come up with the idea for the Iron Fey series? Faeries, the old, ancient fey, not the glittery winged sprites, have always fascinated me. But I wanted to write a book that was different than other faery books. So I began thinking: what are the fey afraid of? The answer, in most ancient mythos, is iron. Faeries can't stand the touch of iron and steel. So, what if there was a new type of fey that had evolved with progress over the years? What if they weren't only immune to iron, their existence was slowly poisoning and corrupting the lands of the traditional fey? And I realized we already have "monsters" in machines: gremlins, bugs, viruses, ect. And from that thought, the Iron fey were born. 2. Are any of the characters based on someone you know? Not really, though there is a bit of myself in each of the characters. Except Grim. I’m nothing like Grimalkin, as he would tell you himself, I’m sure. 3. Why did you decide to do The Iron Knight from Ash's point of view? Well, Meghan’s story had come to an end in The Iron Queen. I had a very specific character arc in mind for Meghan when starting this series; she had to learn to accept responsibility and act for the good of all, even at great cost. And she did. Her story was done, so it was up to Ash to continue the tale, to figure out how far he is willing to go to be with the one he loves. 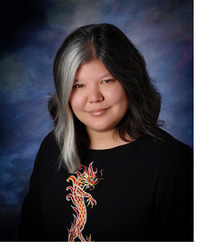 About the author: Julie Kagawa was born in Sacramento, California. But nothing exciting really happened to her there. So, when she was nine she and her family moved to Hawaii, which she soon discovered was inhabited by large carnivorous insects, colonies of house geckos and frequent hurricanes. She spent much of her time in the ocean, when she wasn’t getting chased out of it by reef sharks, jellyfish and the odd eel. Julie now lives in Louisville, Kentucky, where the frequency of shark attacks is at an all- time low. She lives with her husband, two obnoxious cats, one Australian Shepherd who is too smart for his own good, and the latest addition, a hyperactive Papillon. We thank Julie Kagawa and Harlequin Teen. Our review: What can I say about Ash? He was crowned Prince of Swoon the first moment he was introduced in The Iron King, dark, mysterious and deadly. As Megan's story progressed throughout The Iron Fey series, so did Ash, so I was delighted when I learned one of my favorite YA authors was giving him his own book. He deserved it! After all, he stood beside Megan through battle after battle, even when sickened by iron, because of his love for her. In The Iron Knight we find out about his past, his love, and see what he has to endure in order to reclaim the one girl he truly loves, Megan Chase, now the Iron Queen. Kagawa has done it again. I was skeptical, at first, about Ash going solo. Ha, the author showed me. Ash's story is engrossing, interesting, and full of excitement. Can I say how much I loved that Puck--that red haired summer fae, the master of deception and illusion--travels with our beloved ice prince (or should I say, ex-prince since mom Mab has given him the boot?). The rapport between the two has always been entertaining and their adventures far from being mundane). This time we get to see these once best friends recapture and reclaim a friendship they both missed and sorely needed back in their lives. Both characters mature and show their capabilities to be utterly selfless. If Ash is to ever love Megan and be with her, he has to get his soul. This book is his journey to do just that. With the aid of Puck, the ever lovable Grim and a surprise additional member I won't spoil, the group begins their quest. New, oddball characters and strange places are shown throughout and I was fascinated by the vivid imagery and lively descriptions Kagawa painted with her skillful pen. One of the biggest points about the Iron Fey series is the fluidity of the writing, how we can put ourselves in the main character's shoes and experience every little thing--from scents to touch to emotion--through the author's words. 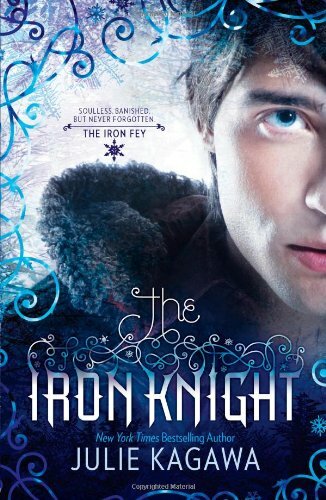 The Iron Knight is a fitting and wholly satisfying conclusion to a much beloved YA series from this reader's perspective. I couldn't imagine a better way to conclude Megan and Ash's story. Simply loved it. Thank you, Julie Kagawa. Thank you for the interesting interview and synopsis of the story. It sounds great and I appreciate the giveaway opportunity. Ms. Kagawa paints a vivid picture of the Nevernever, the Iron Realm and the creatures that inhabit it. You find yourself drawn into her world and living the story. The magic in the book is a lot of fun and fits each character perfectly. The lead characters are very compelling and well developed as individuals.